TSMS CET 2018 Hall Tickets - Model School 6th, 7th,8th,9th,10th Entrance Test Hall Tickets 2018 download, TS Model Schools Entrance Test 2018 HallTickets, TSMS CET 2018 Hall Tickets, TS Model School 6th/7th/8th/9th/10th classes Admission Test 2018 Hall Tickets, TSMS Entrance Test 2018 Hall Tickets download, This year Telangana State Model Schools 6th/7th/8th/9th/10th classes entrance test notification 2018 has been issued on 1st January 2018 by the Telangana State Government, School Education Department, Rashtriya Madhyamik Shiksha Abhiyan and TSMS CET 2018 for admission into 6th/7th/8th/9th/10th classes in Telangana Model Schools for the academic year 2018-2019 for fill up the vacant seats. TS RMSA, Hyderabad was invited the online application forms from the eligible students through telanganams.cgg.gov.in webportal from 23rd January, 2018 to 28th February, 2018. 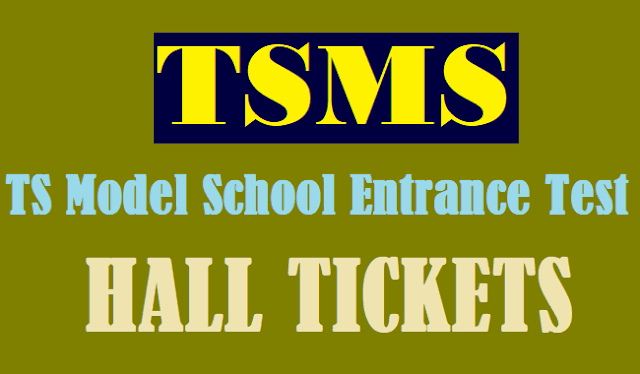 TSMS 6th/7th/8th/9th/10th entrance will be conducted on 15-04-2018 at each mandal head quarters or model schools in all districts of T State and exam will be held from 10.00 AM to 12.00 Noon for 6th class and 2 pm to 4 pm for 7th/8th/9th/10th classes as per its schedule. Step 2: Click on the "Download VI Hall ticket/ Download VII-To-X Hall ticket"
1. Without hall ticket candidates are not allowed for examination. 2. To obtain duplicate hall ticket, candidate should approach the Chief Superintendent concerned, with passport size photograph & copy of online application form. 4. Candidates are not allowed in to the examination hall after 10:00 AM and to leave the hall before 12:00 NOON. 5. Answers to be marked with blue/black ball point pen only on the OMR sheet. 6. OMR sheet with over writing, correction etc. will not be considered for valuation. 7. Candidates have to bring writing pad and pen. 8. Mobile phones, calculators or any other electronic devices are not allowed in to examination hall. 9. Malpractices during the examination will disqualify their candidature from the examination. 10. On completion of the examination, candidate has to handover OMR sheet to the invigilator. The total marks for the test are 100 and duration of 2.00 hours (i.e) from 10.00 AM to 12.00 Noon.